You asked, we listened! A soft, full sole leather ballet shoe with NO annoying drawstring! 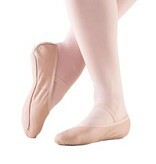 Four widths, A-D, and half sizes to fit almost every dancer's foot. Single pre-sewn elastic strap. Snug fit same as children's street shoe size. Need growing room? Add a 1/2 to 1 size.